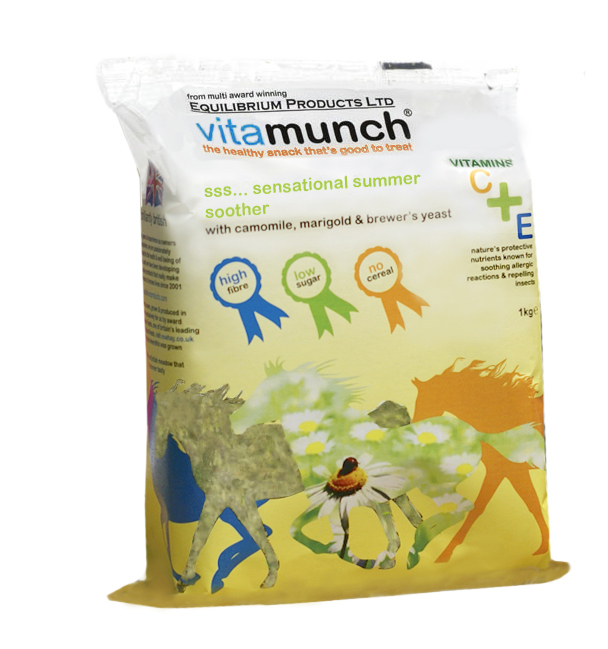 Equilibrium Vitamunch is a forage based snack block, containing the highest quality Timothy grass, vitamins, minerals & herbs. As it is high in fibre, but low in sugar, with no cereal, it can even be fed to overweight or laminitis prone horses & ponies. The Vitamunch blocks are sealed in an airtight bag, within 48hours of the Timothy Grass being cut. This maintains ultimate freshness for your horse. The 1 kg blocks are ideal to feed as a snack anytime, anywhere: in the stable; in the field; whilst travelling or at a competition. As they are compressed, they take longer to eat than normal hay, so they can be great at entertaining bored horses. They can be fed dry, wet or in a net. They come in three delicious flavours: Soothing Summer; Marvelous Meadows or Heavenly Hedgerow. Soothing Summer is enriched with added Camomile, Vitamins C & E; Marigold & Brewers Yeast, to help your horse cope with pollen, heat, insects & flies. Marvelous Meadows is enriched with added dandelion, red clover & nettle. Heavenly Hedgerow is enriched with cleavers, hawthorn & rosehip. Equilibrium Munch Nets are also available & they have been specifically designed to feed Vitamunch blocks. All Equilibrium products are Beta NOPS accredited & made in the UK. The Elim-a-net is a fantastic, innovatively designed hay-net, designed to slow down your horse's consumption of hay. Ideal for laminitics, overweight horses, or anyone wanting to promote a more natural, slower eating pattern, with less wastage of hay. Equistro Flexadin UCII is a unique joint supplement, containing collagen in a pure (non-hydrolysed) form, so it is more effective in supporting joint function. Flexadin is ideal for athletic horses who need maximum mobility & joint health. Equilibrium Calmmunch is a forage based snack block, containing the highest quality Timothy grass, vitamins, minerals & herbs. It?s specially designed for stressed or excitable horses; it contains calming magnesium, camomile, B vitamins, vervain & hops. Equilibrium Munch Nets have small holes & are specially designed to hold munch blocks (Vitamunch; Fleximunch; Hoofmunch & Calmmunch) without wastage. They can also be used for normal hay to slow down the rate of eating & minimise waste. Ekyflex Nodolox is a nutritional supplement designed to support the musculoskeletal system. It is useful for both sport horses in work or horses suffering from arthritis. Equilife Weigh Tape is an ideal way to estimate your horse or pony's weight, enabling you to give the correct dose of wormer or medication. It can also be really useful as part of a weight loss or weight gain program. Spring Balances are ideal for weighing haynets, so that you can accurately control the forage intake of your horse. This is very important for weight & condition management. This item is currently out of stock with our supplier until December 2018.